Organized labor reminisces too much. I understand why. Look at this graph. 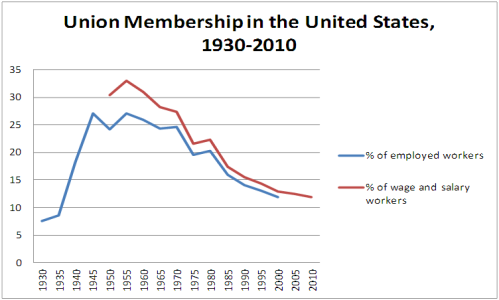 The percentage of union workers peaked in 1954 at almost 35% and has been in steady decline since. Today, a little over 11 percent of the workforce claims union membership. The strength of America’s middle class depends on the strength of our unions. When working people stand together to bargain for fair wages and decent benefits, our middle class gets stronger. How Can We Start Developing More Leaders? Here are three areas where I believe labor unions can do a better job and make progress: Leadership Development, Communications and Vision. We have a few excellent union leadership training programs including City College of San Francisco’s Labor and Community Studies curriculum. But we can do so much more. Where to begin? To borrow a phrase from the environmental movement…Think global, act local. As local union leaders, we need to identify the best people in our unions, the top 20 percent, and develop their leadership skills. Teach them and mentor them not just in the art of negotiation, but also in practical skills like how to prioritize…how to run a meeting…how to listen to members and employers. Teach your developing leaders how to move beyond their comfort zone and embrace the unknown. That’s where some of the most productive and exciting work happens. Most importantly, teach your leaders how to build relationships. In my experience, relationships are at the heart of every successful transaction. Good leaders are hard to find. And often when we find them, we feel threatened that they’ll take our jobs. I’m telling you today. Find a place for your leaders. Give them roots and then give them wings. Let them soar. Our labor movement desperately needs good leaders if we are to survive and more importantly, thrive. 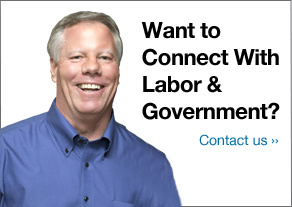 Stay tuned for Part II of my blog post when I discuss why labor unions must develop better communications strategy and vision.